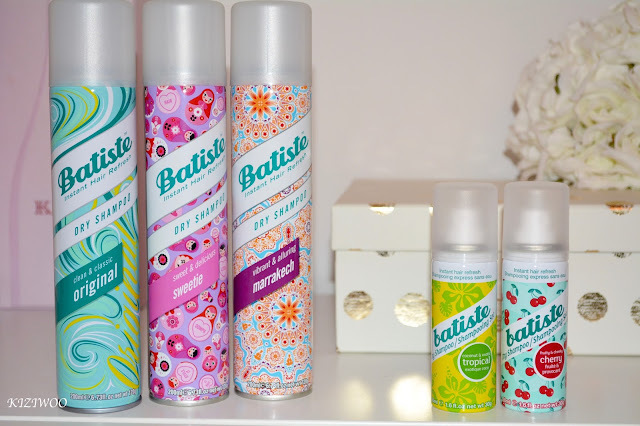 I'm sure by now you all know how much I like Batiste Dry Shampoo, so it would be understandable to say I was over the moon to win this gift pack from Batiste! Some of the dry shampoo are fragrances I'm familiar with, three full size (200ml) and two travel size which are 50ml cans. 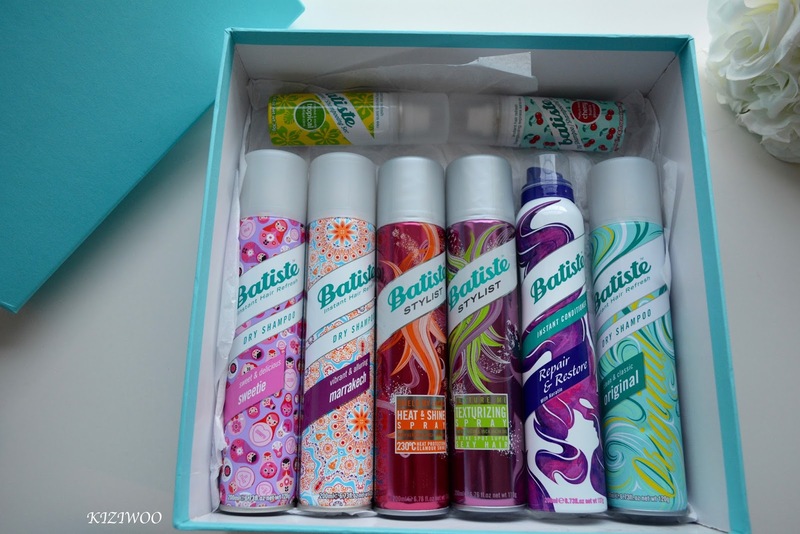 The pack also contained two of the Batiste Stylist range and an Instant Conditioner. 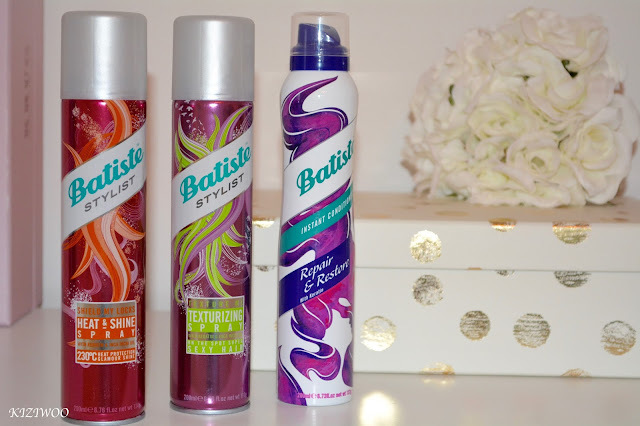 So lets get started with the Dry Shampoo's. 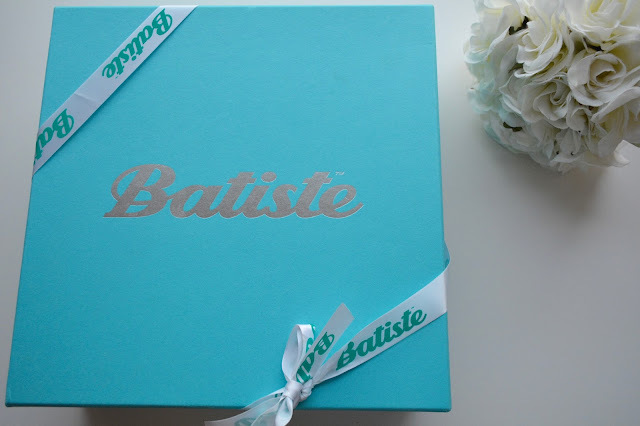 The Dry Shampoo's in the box are a really lovely selection. 'Original' is a very light, clean and classic fragrance so it's perfect to anyone new to dry shampoo. Next up is 'Sweetie', this is a yummy sweet raspberry and vanilla scent and I have to say it's one of my personal favourites. Finally from the full size cans is 'Marrakech', this is a spicy, warm scent which leaves you feeling like you need to book a holiday in the sun! The smaller 50ml cans are perfect for anyone travelling, for your gym bag or to simply drop into your handbag for that on-the-go spritz. The fragrances I have here are 'Tropical' a gorgeous coconut scent (and boy do I love the scent of coconut) and 'Cherry' which is a little on the heavy side for me, however if you like the smell of Cherry then I'm sure you'll love this one. 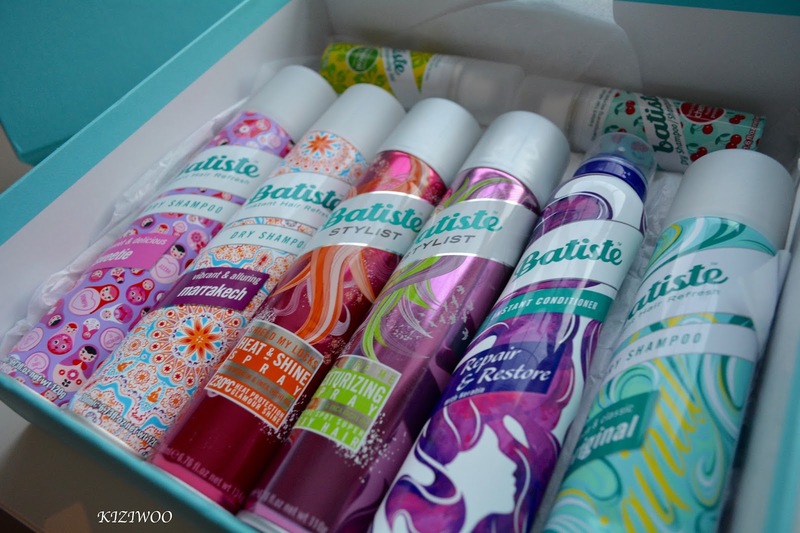 Now onto the newest additions to the Batiste family, I'd not used any of these since they launched so I was excited to try them out. First up is the 'Heat & Shine Spray', this clever 2 in 1 spray protects hair against up to 230°c when using straightening irons or tongs. Your hair is therefore shielded against even the hottest styling tools! Developed for dry hair much like the heat protecting products you'd find in your local hair salon. Once you've dried your hair, simply spray into your hair and begin your heat styling. This is great for those who have little time in the mornings and would maybe wash there hair in the evenings then heat style in the morning before work/school. Finally let's look at the Instant Conditioner Repair & Restore. I have to admit this has taken a little getting use too I'm not going to lie. The idea of spraying in an aerosol based conditioner onto dry hair baffled me no end! Over the time I have tested this out I will say it has been great to use when I've curled my hair and the ends need a little TLC a day or so later. Excessive usage will leave your hair looking limp so I'd only recommended this as a little top-up if you're fond of heat styling rather then reaching for serums which can weigh the hair down - the Repair & Restore is weightless.